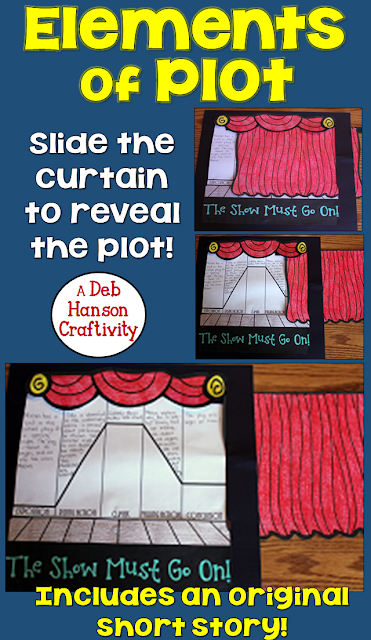 Teaching Plot with a Picture Book... with a freebie! What is your first ELA topic to cover each school year? 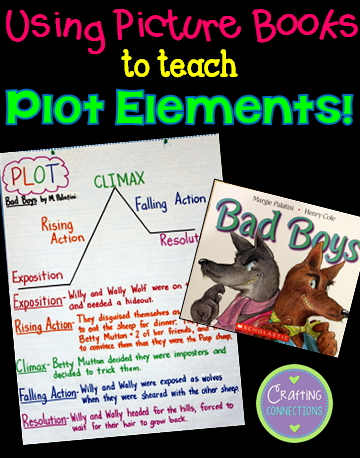 When I co-taught in 5th grade classrooms, we always started with teaching the PLOT ELEMENTS. I would introduce the topic with my PowerPoint on the first day, but on the second day I would dig out a picture book! 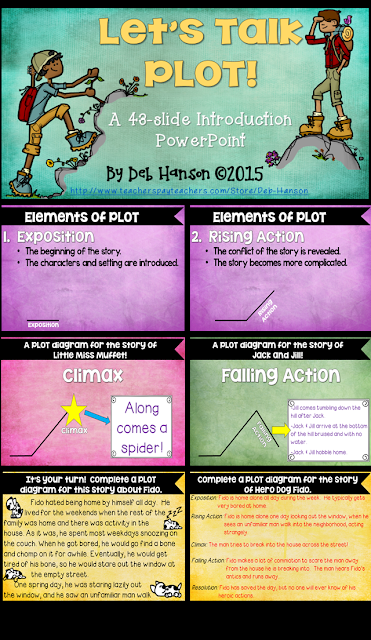 Picture books are perfect for teaching plot elements in grades 4-6. As we all know, upper elementary and middle school students still love picture books. Another benefit is that they are short- in one class period you can read an entire picture book and plot the story on a plot diagram. As I have mentioned in previous blog posts, Margie Palatini is my go-to author when I am looking for picture books to use with my upper elementary students, so I chose one of her hilarious books to use in this plot lesson. Before class, I draw a basic plot diagram on an anchor chart (the black line only), and then as soon as class begins I ask the students to recall what they learned yesterday to help me label the various parts of the plot diagram. 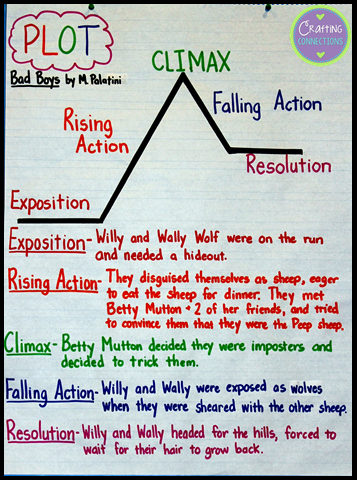 After we finish the book, students help me write sentences that summarize the exposition, rising action, climax, falling action, and resolution of the book on the anchor chart. 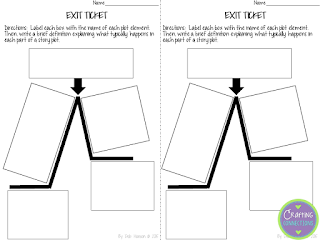 Finally, I give each student the exit ticket shown below. (Click HERE to download it for FREE!) I also set the anchor chart face-down on a table until all students have finished their exit tickets. Keep reading below to find out how I plan my 5-day study of PLOT. 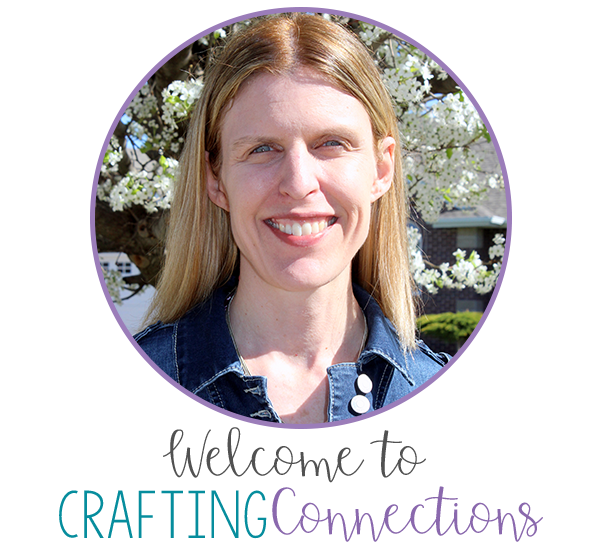 Feel free to check out the resources shown if you are looking for additional plot activities to do with your upper elementary and middle school students (just click on the images)! Day 1: I show students my PLOT POWERPOINT. 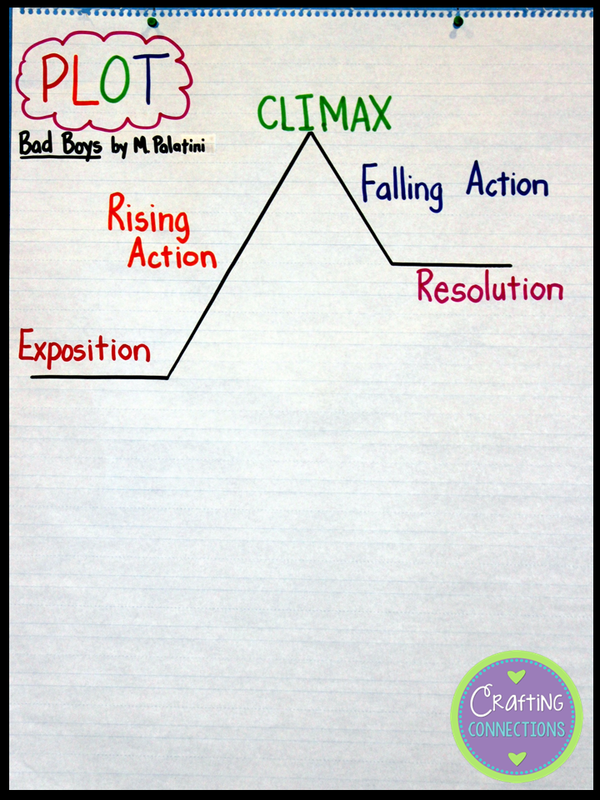 Day 2: We do the activity described above, reading Bad Boys and creating the anchor chart together. Day 3: Students work through these PLOT TASK CARDS. Students who are ready to work independently do so, while students who need extra support work through these passages with a teacher. 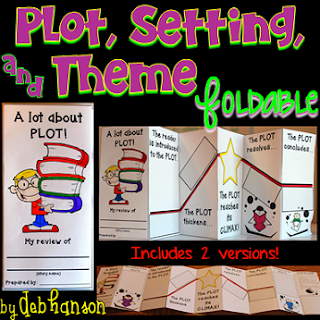 Day 4: Students read the short story, label the plot diagram, and create the foldable. 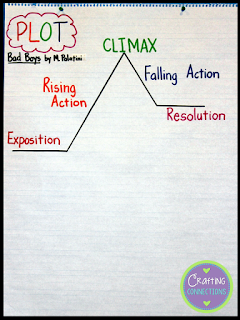 Day 5: Students read the short story included in this resource and identify the plot elements. (I use this as an assessment.) When finished, they assemble the craftivity. Awesome! Some of my favorites include Bad Boys (and its sequel Bad Boys Get Cookie... there is another called Bad Boys Get Henpecked that I haven't yet read), Piggie Pie (and its sequels, Zoom Broom and Broom Mates), Sweet Tooth, Goldie and the Three Hares, and Bedhead. Perfect timing! 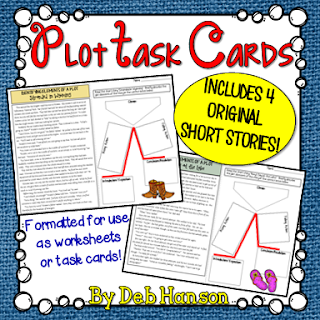 I am working on PLOT this week! I am thankful my school library had this book. I will be using this lesson! :) Thanks a million, Deb! I've never heard of this book- but I'm anxious to get it and read it! This was a very good blog post! Thanks for sharing your ideas!